This past weekend we babysat our niece Annissa so that her parents could go out for Valentine's Day (and the following night they returned the favor). 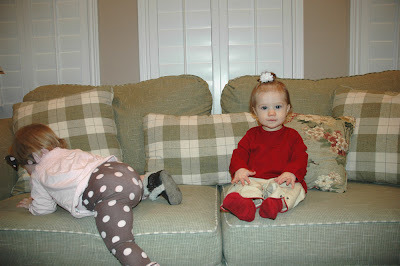 Ava really enjoyed the time spent playing with her cousin. 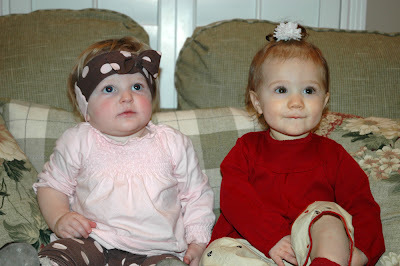 And we of course had to take some pictures of the two little girls hanging out together. 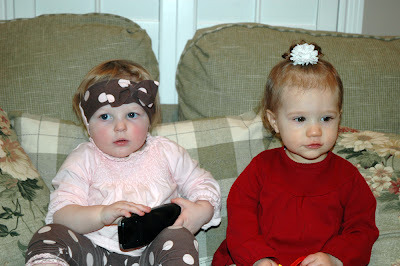 The girls were getting a little bored so we put on an episode of Disney's Little Einsteins. Annissa quickly established that she was in control of the remote. They soon became annoyed by our picture taking because we were blocking their view of the television. Annissa finally decided she had had enough and ventured off for a better view. 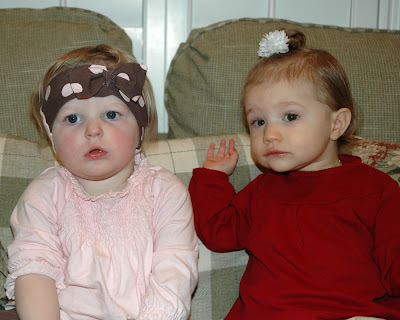 Apparently these two little starlets just don't have any time for a photo op. And who can blame them? Those Little Einsteins are so very captivating. Isn't it fun with other kids?!?! I'm sure Ava had fun...even if it was a little crazy for Mom & Dad!! I know that's how it is for me during the week!!! Looks like they had a good time...both so so cute!! I just love the pictures of these two. They are darling. I am so excited to have them so close in age. It is going to be so much fun! Thanks for babysitting!